AC/DC biographer and notable Australian music journalist Murray Engleheart says the band will continue to record and tour with Axl Rose. The Guns N’ Roses leader stepped in to help AC/DC complete the final 2016 dates of their world tour in support of 2014’s “Rock Or Bust” when the trek was temporarily halted after singer Brian Johnson was advised by doctors to stop performing in arenas and stadium-sized venues immediately or risk total hearing loss. 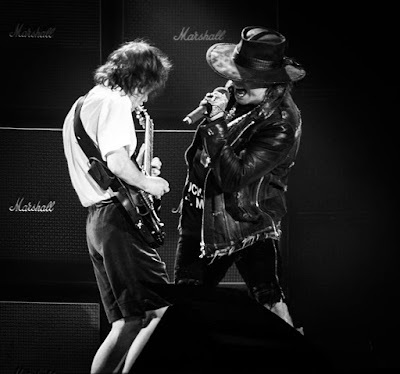 The biographer’s comments mirrors similar speculation about the pairing last year by Noise 11’s Paul Cashmere following multiple guest appearances by Angus Young during Guns N’ Roses Australian tour. During an interview event in London, UK in June of 2016, Rose revealed that he was planning new music with Guns N’ Roses and, possibly, AC/DC as well. "We are working on new stuff,” explained Rose. “I've got a lot of stuff together, and I played some stuff for Slash and Duff and they liked it. And Angus and I are talking about working together. So we’ll see." Angus is the lone remaining original member of AC/DC after a number of changes in recent years, including the 2014 retirement and 2017 passing of co-founder Malcolm Young, a series of legal issues faced by drummer Phil Rudd, the spring 2016 departure of Johnson, and bassist Cliff Williams’ retirement. Three of the longtime members have seen their roles filled by others: guitarist and nephew Stevie Young stepped in for Malcolm; Chris Slade returned to handle drums after Rudd recorded “Rock Or Bust”; and, Rose was aboard for the 2016 dates in place of Johnson. Rose continues to tour with a partially-reunited Guns N’ Roses alongside guitarist Slash and bassist Duff McKagan; the trio have extended the reunion tour into a third year with the addition of summer 2018 concert dates across Europe.